The thing that makes any camping trip special is any freshly prepared dish. But to keep your taste buds happy in a camping trip, you need to arrange for a proper heat source. To prepare food using woods and dry leaves can be a bit of challenge. Well, you have no reason to be tensed as long as you have the portable backpacking stoves. 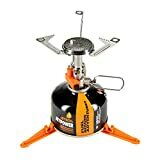 Camping stoves are light in weight and durably built. So, you will be easily able to carry them and enjoy freshly prepared food amidst nature. 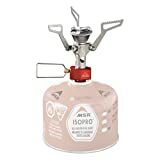 But which camping stove do you need to choose? This can be quite tricky given the fact that there are several camping stoves available in the market. 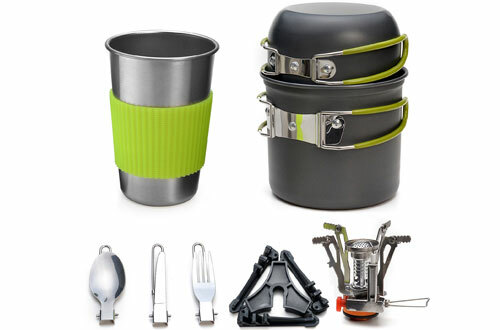 To make it easy for you, we have reviewed the top-rated backpacking stoves. And so, only the reliable ones are listed. As soon as you open up the package, you would find it to be extremely compact and light. 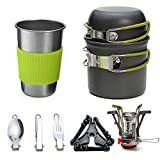 This would be the best gift for one of your family members or yourself if you love camping, hiking or trekking. It weighs just over 1 pound and doesn’t add much to your gear for your trip. Plus, you get a pot and pan made of strong yet light anodised aluminium. This helps in better heat distribution and heats up the cookware quickly. Further, these products are even FDA approved and have an internal material that isn’t very reactive or toxic keeping your food safe for consumption. The design is intelligent enough to keep most things foldable. Even the handle of the backpacking stove cookware is foldable so that they are easy to store without taking up much space. This comprehensive set would allow you to make delicious and appetizing dishes that involves frying, boiling or stir-frying. The frying pan is non-stick and easy to clean. 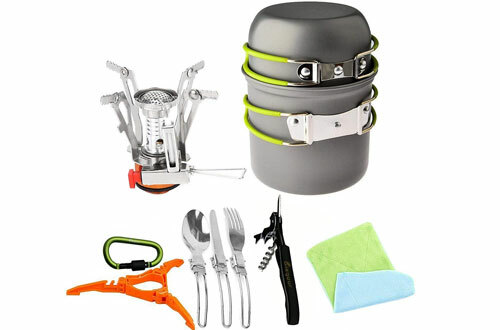 You get a small mesh bag for conveniently carrying this cooking set by hanging it to your rucksack hook. Includes a foldable and expandable stainless steel fork/spoon/knife. 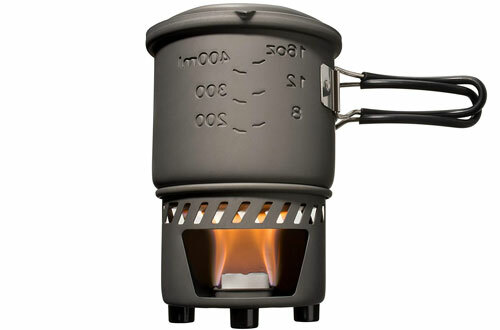 With its amazing size and impressively fast boil times, the PocketRocket 2 is one of MSR’s best selling stoves. You will be astonished that despite being the size of your fist how efficiently and fast it can boil a litre of water in just 3 and a half minute. The pot supports have been designed in a way so that they can be folded down to create a further tiny pack size. Also, the support has been improved since the last model and made of robust stainless steel and now support a wider range of pot sizes. Moreover, the stability on this stove is unmatched and you wouldn’t find any sort of wobbling. The burner has a tri-headed metal piece separating the burner area into three sectors. So even if you are at a windy place the stove is always lit since at least one of those burner areas is always shielded. You can precisely control the flame. First things first, the Odoland’s camping cookware is very lightweight and durable. You would be able to cook gourmet dishes even at places untouched by civilization. Well, one gets a stove that has a tiny size compared to rest of your gear and can be folded for an even smaller pack size. Along with it, the two aluminium frying pans that have a non-stick inner surface. So you can eat healthily and cleaning the pans later becomes even easier. Furthermore, the stainless steel cup you get would be best for heating up beverages thus saving precious burning fuel for you. The silicone cup acts as a great insulator and attaches under the steel cup to keep your beverage extra warm. Lastly, the handles of the pot are made both anti-slip as well as anti-heat. You get a spoon, knife and fork that can be carried in the small utensil pouch. A manual clearly and descriptively shows you how to use the product. A lush case that can fit all the pieces inside of it for better portability. 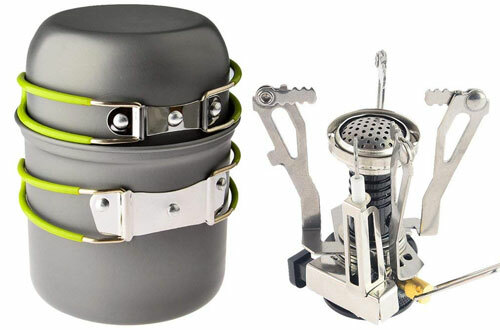 This is an outdoor portable backpacking stove that is light-years ahead of its competition in terms of capabilities. At an affordable price tag, it has all the integral parts you need even at rugged regions with harsh conditions. 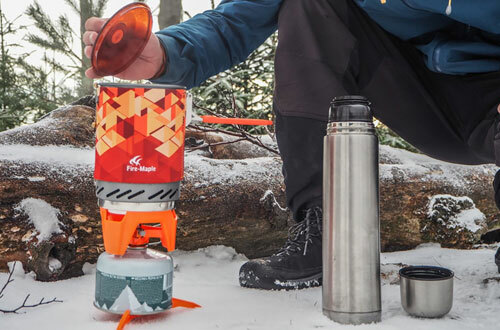 You get an insulated one litre plus pot with a built-in heat exchanger. Next, one also gets a snap on lid that has a small spot for sipping your beverage or soup. This simple yet genius design keeps the food inside warm for a very long time. A little orange bowl is included which you can fill up the cooked food to eat. The stove is another wondrous part of this unit since it has ignition integrates into it. It fits the pot quite well and is very stable and firm with proper heat distribution. Moreover, apart from hot proof covers, it has a hard anodized construction. Thus, it is stronger and washing it has become easier. Coleman has always been a leader in this segment and the Sportster II goes to push their excellence even further. 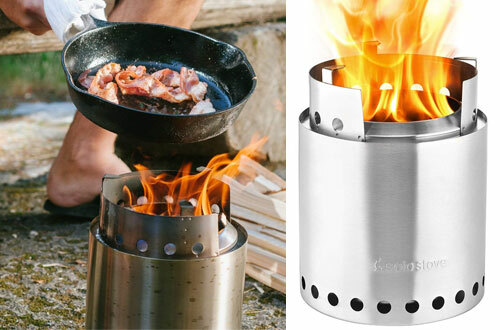 In a single unit, you get both the backpacking stove’s gas cartridge and the stove integrated as one. 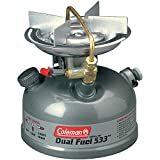 It is powerful and reliable enough to not fail you in any type of weather and can cook all your meals with the single burner stove. Furthermore, it has just the right size so that it is compact enough to not be a burden on your rucksack. But it is big enough to prepare hearty meals for more than a couple of people. Other than your hunting or adventurous camping trips, it can even act as an emergency alternative. One cannot even forget the patented Dual Fuel Technology and 10,000 BTU. 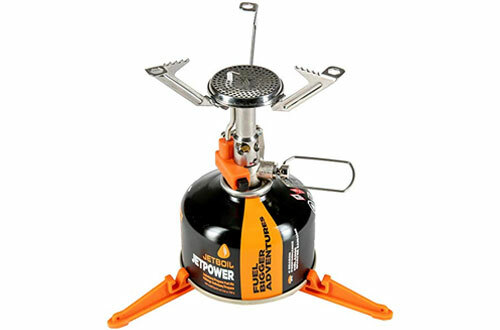 Petforu’s portable camp backpacking stove features a piezoelectric ignition that is much more reliable and safe than other forms of fire starters. Firstly, you get a superior construction of high-quality steel and an aluminium alloy that is compatible with most types of gas tanks. Stir fry or fry vegetables and meat in the FDA approved pan and boil delicious soups or stews in the robust pot. The aluminium pan is made of non-toxic high-temperature proof materials and so, you will not be subjected to any sort of burns. Plus, the folding handles make it easy for the campers, hikers etc to carry it. Above all, it’s clutter-free and affordable solution unlike anything else you can get in the market. Get a mesh bag for convenient carrying. Just over 3 ounces in weight. 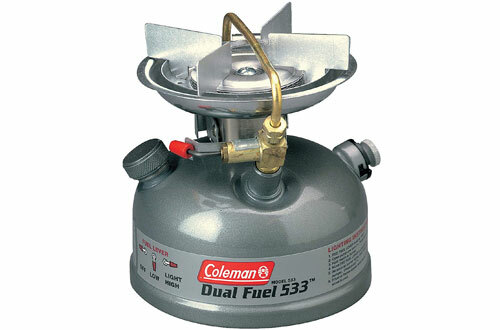 Fuel canister fits inside the pot for greater portability. 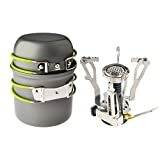 Coming with a backpacking stove’s canister stand for fuel, the nested packing design adds to the convenience of these adventurers. The stove has a nice three-point base that sits steady on the ground and fires up nicely the pot’s internal heat exchange chamber. Along with n extra pot holder, it features foldable handles. Even the tripod you get holds in the fuel canister pretty secure and eliminate chances of any shakes or wobbles that can be very risky. All the components have such well fitting structure with keyholes and knobs that the whole unit acts as one when they are connected. Having a stainless steel aluminium construction, it has a capacity of 1-litre. Pot base holds other sized pots and frying pans. Heat exchanger doubles as a windscreen. Includes a water-resistant cloth for covering purposes. 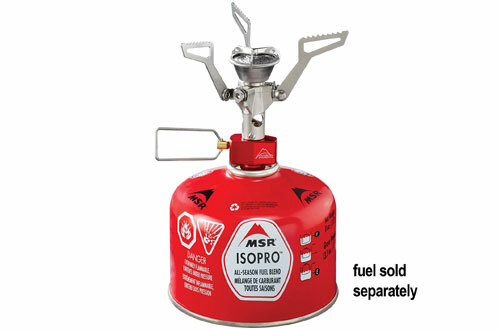 Solo Stove campfire is a tactical gear that has immense advantages over its competitors. This is an ideal survival, camping or hunting gear where you don’t need to carry fuel and bear the risk of running out of it. You can burn anything from wood, sticks, twigs, pines cones or any dry burnable thing you can scourge from Mother Nature. Also, it has a double walled design it acts as a natural gas or fire stove. The holes drilled at the bottom pulls in oxygen and after secondary combustion throw fire from the top. Thus, this action sends temperatures up very quickly and you can get an efficient fire going very quickly. Other than that, it doubles as both a stove and a nice warm campfire. Has a nichrome wire gate. Boils 32 ounces of water within 2 to 4 minutes. Esbit gears are always very interesting as well as well-made and this 3 piece cook set does not fail those expectations either. The 3 pieces constitute of a lid, 585-litre pot and the bottom stove. One can even use various forms of solid fuels for this stove like Esbit tablets or trioxane. Solis fuels are much better and a lot safer than pressurised canisters since they have a negligible chance of explosion due to carelessness. And also, the pot is large enough for cooking satisfying meals and can store all the components inside it. Furthermore, built of hard anodized aluminium, it is equipped with stainless steel grips that are hinged. Foldable stay cool handle that reduces the size for packing and folds flat too. 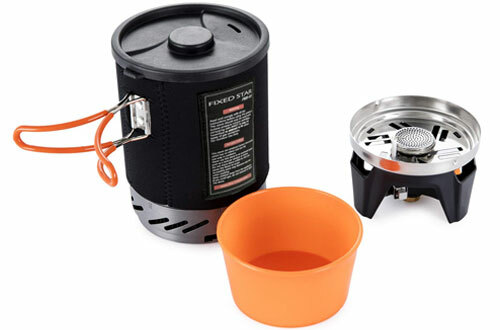 Jetboil is pretty well-known for their canister stoves and all-in-one systems. The MightyMo routines that quality performance but provides it in a compact and light single burner unit. 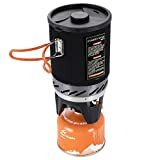 If you are a minimalist backpacker or hiker who needs something that’s going to perform well in a variety of conditions, then this stove is it. It has an internal ignition that keeps you covered even when you forget to pack a fire starter of any kind. Further, it is adjustable and very accurate simmer controls. So you are free to blast your pot or ban with 10000 BTUs or simmer it back way down to cook a slow cooked meal. Besides the four-turn regulator, it also has a push-button igniter. There is also an internal pressure regulator. Finally, even during very cold temperatures (as low as 20 degrees Fahrenheit), it can draw out fuel from canisters. Very sturdy and has stiff arms. 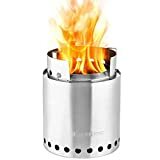 Make your adventures full of thrill and cook proper meals with the help of best portable backpacking stoves for camping and travelling.